Elixir is a wonderful language. Expressive, productive, scalable, fault-tolerant… it’s pretty darn cool. But how do we manage projects which use different versions? 🤔 What have we done so far? We want to install the latest version of Elixir. Right now (4 Jan 2019), the latest version of Elixir is 1.7.4, so that’s what we’ll use. Wait, what version of Erlang do we need for Elixir 1.7.4? 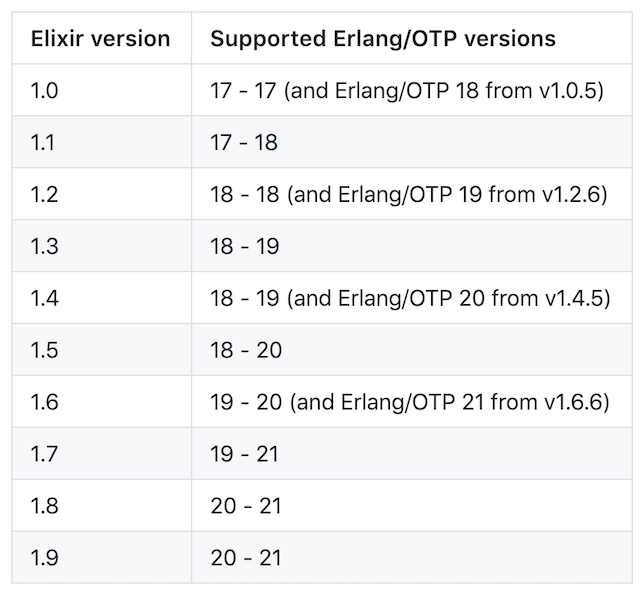 According to the table above (found on this page), Elixir 1.7 requires Erlang versions 19 to 21. So we’ll first install Erlang 21.1. Then when that’s done, we’ll install Elixir 1.7.4. Okay, Erlang and Elixir are both installed. We should be done now, right? Not yet, but we’re close! What have we just done there? We’ve told asdf to use Erlang 21.1 and Elixir 1.7.4 any time we run an Erlang or Elixir command if the folder doesn’t have a .tool-versions file to specify which version to use. So effectively, we’re now using Erlang 21.1 and Elixir 1.7.4 by default. Now we have just one thing left to do: test it! Perfect! You’re now ready to go with Elixir and Erlang. Fantastic. We’re now in a fantastic position to take on any project (no matter what version of Elixir it requires!) and start pushing out code. Got stuck? Leave a comment; I’ll do my best to help!